It remains a given fact that the current IEBC, as it is, cannot conduct a free and fair general election come next year. Even if there were intentions and plans initially to carry out credible elections, the trust of a faction of Kenyans is fast fading out. The integrity of the commissioners has failed the test of Kenyans. That some stakeholders are accusing IEBC of impartiality is a strong reason to have the commissioners resign and the electoral body reformed. 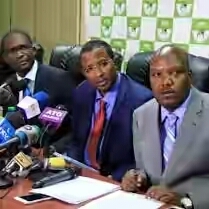 Basing on the responses that IEBC commissioners- including the chairman- have been giving lately on whether to vacate or not, it is clear that the matter is now personal. The commissioners have clearly developed a negative perception of CORD and others calling for their removal. In fact, they consider them personal enemies as they threaten their jobs. Consequently, it is very likely that they will express the same animosity come next year. The government’s hard stand regarding the IEBC stand-off may indicate the biasness that CORD and others are accusing the government. Insisting that the ‘right channel’ should be used amounts to stating that protests are against the constitution. Giving a chance for dialogue may save the nation a critical time as this one. With dialogue, the commissioners can also negotiate their send-off and pave way for the creation of a new commission. This will not only save their image, but will also save the nation from the escalation of violence. Kenyans need peace. A fair, transparent and credible election is the only way to ensure that Kenyans get the peace they deserve in 2017. Strategy again takes several months. Write original content that offers unique help, and start to get some anchored backlinks. I am sure this article has touched all the internet visitors, its really really good paragraph on building up new webpage. Thank you for your good feedback. out any matter on net as compared to textbooks, as I found this post at this web page. going to have a good read. I appreciate you for sharing! Thanks for your interest in our website. the music activity for My – Space that you would like, there is also a chance to pick from different genres. Cherry blossom tattoos represent something more important in several cultures. These art reproductions of paintings printed on canvas sheets or paper after which framed and hung on walls. called Front Sight Challenge. “Because you happen to be here looking over this games report now with this particular point in time; whatever you have is “The first movers advantage” yourself to adopt a hold of now. The Open Video Project: This is site using a huge number of digital video for sharing. somebody you trust to assist you choose your first guitar. Because the admin of this web site is working, no doubt very soon it will be famous, due to its feature contents. page? I’m having a tough time locating it but, I’d like to send you an e-mail. suggesting that I extremely enjoyed the usual info an individual provide to your visitors?